When you first held your child, you had this amazing mix of wonder and fear. You had this uncertainty about what the days ahead would look like, but the powerful certainty that you loved this child and would do anything and everything for him or her. We make it through the phase of no sleep, just glad to still have our sanity and then we go from phase to phase of their development always feeling like we are trying to catch up. We always have good intentions about how we’ll read with our kids, solid plans on how we’ll discipline, defined time limits on screens, and TV….Meanwhile, time is slipping by faster and faster… You look at old photos, facebook memories, and suddenly they seem so big now because you see how small they were…. We want to talk to you about getting to that place where you always intended to be as a parent. We want to become the parents we always intended to be. There is so much that is outside of our control about the world that our kids are growing up in. However, the greatest influence in their lives is us, and we have 100% control over that. 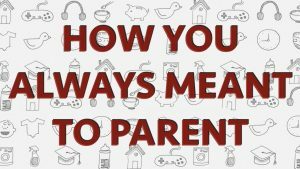 “Parent” isn’t just a noun, it’s a verb. Parent is not just what you are, Parent is what you do. It’s an active role which includes discipline and even punishment. Discipline is not always punishment, but the Bible makes it clear that discipline should include punishment. Kids are full of potential, and an ancient poet captured this idea of potential and power in the line “like arrows in the hand of a warrior are the children of youth.” Our kids can make quite an impact on the world and go farther than we will ever go, it’s hard work to draw back the bow, it can be even harder to let go. Parenting sure ain’t what it used to be! Nowadays kids have near constant access to all sorts of information that we had to get on the playground from some older kid named Jimmy. Raising children in the technology age is way different, but it turns out the analog wisdom of God’s Word has some relevant and practical advice!